Even with the advent and continued expansion of cloud computing, there are plenty of reasons why your existing server may need to be replaced. It may even be the case that your needs have changed and you need to implement an on-site server solution. We can source, configure and install Windows servers. We can then supply, configure and monitor your offisite backup solution so that should the worst happen, we can still get you back up and running on a temporary server within a few hours. Don’t think that just because you’re a small business, they won’t see you. The EU’s General Data Protection Regulation (GDPR) comes into force on 25th May, enforcing a strict set of new rules concerning privacy and data security and imposing strict penalties on violators. GDPR affects anyone holding data on EU citizens, including those companies not in Europe. A survey carried out in December 2017 of over 1000 companies found that a lot of them have still have no clue about this yet. You may forgive the overseas businesses for not understanding that they’ll also be affected, but the Brits were the worst. ONLY 39% of UK companies realised that they were subject to the regulation. One of the big concepts that GDPR changes is consent. Companies already need consent to process someone’s data, but until now they only had to ask once, and that covered all uses. Not anymore. GDPR’s ‘unbundled’ consent means getting separate permission to use customer data for different things, such as marketing, maintenance, fraud checks and support. Documentation is also stricter: businesses must record when that consent was given. Neither can service providers assume consent by 'pre-ticking' boxes and forcing people to untick them. Instead, they must make consent clear in legal contracts and customers must opt-in rather than out. On a related note, customers might just ask for a copy of their data rather than deleting it. Upon request, the ‘data controllers’ must provide a machine-readable copy of the customers data so that they can send it to another provider should they chose. GDPR also asks organisations to provide extensive supporting material as part of this process, including the categories of data that they are handling, along with the reasons for processing it. All of this must happen within a month of the request. Portability and erasure could be tricky issues in a small business for both technical and organisational reasons. Firstly, they may not have the same kind of formalised process for handing data that some larger companies do. If your customer data is scattered across a selection of network folders, databases and individual PCs, you’ll have a tough time retrieving it for one customer. Now imagine if you get ten requests in a week. The other issue is that GDPR’s third party requirement may be more likely to bite SMBs. A small company without a large, well-funded IT department is likely to rely more on third party data handling services than a larger company that can build things in-house. If services like cloud-based backup, third party order processing, outsourced customer support or SaaS application providers are storing and processing your customers’ data, that makes them ‘data processors’ in GDPR jargon. A request to delete or reproduce customer data affects data processors’ systems, too. Small businesses will need to clarify their contracts with service providers, along with the processes for handling customer requests. Organisations must take technical and organisational measures to show that they have made their data processing compliant with the concept of privacy by design. GDPR specifically mentions encryption and pseudoanoymisation – the process of separating personally-identifiable information from other data attributes to avoid security risks. While these requirements all impose a hefty technology burden on companies, there are other measures that have a greater effect on organisational structure. The GDPR says that organisations must use privacy impact assessments for data processing activities that the regulation defines as high-risk, including monitoring activities. They must introduce audits and policy reviews to continually assess their privacy compliance. Think that Brexit will rescue UK small businesses from all this hassle? Not so fast. The UK will fall under GDPR long before it leaves the EU, and in any case the UK needs to demonstrate equivalent rules if the EU is to exchange data with it. So, there’s a big burden for small businesses to carry – probably far more than they can cope with using the in-house resources available. Where should they begin? Audit the data you already hold and those held by third parties. This is a crucial step, so bring in a consultant to help you with this if you don’t already have the internal resource for this. Many organisations will need to appoint a data protection officer to oversee ongoing privacy arrangements. Small business are generally resource constrained and have less margin for error than large enterprises, who often have a bigger cashflow buffer to tackle wide-reaching challenges like GDPR. Getting external help would be a good idea for a smaller firm wanting to toe the line. With less than 4 months to go, that isn’t a phone call you should put off any more. We can help your business acheive compliance with one, or a combination of IT solutions. If your business IT systems are out of date, not running effectively or not protected properly, you could well be spending unnecessary time and money. We were recently able to help a new client who was in this very predicament. Their ancient setup (server 2003 and windows XP) was hit by an encryption virus just a week ago which left the company vulnerable, without working computers, and at risk of losing all of their data. Luckily after speaking with them we were able to tailor a solution that was going to work best for them, and get them back up and running as soon as possible. We instantly got to work configuring 10 new computers and a server for them, whilst getting these set up we also managed to recover all of their data (65Gb) from a backup, reinstall their network versions of Sage and a CCTV specific application called Cash4W, which meant that when they next walked in to the office everything was set up and ready to go! Following on from this we're installing a phone system next week and have 17 phones on the bench at present being configured. This setup will save this particular customer about £6k a year over their existing setup and about £3k a year over an equivalent setup from BT. Many companies rely heavily on technology like their computers, phones, tablets and emails, to complete day to day business tasks. So what happens when they don’t work or something goes wrong? We’ve put together our top 5 reasons on why your business should have an IT support package and what the key benefits are. Save time and money – Although it may be tempting to save costs and manage all of your IT in-house, it could end up costing you a lot more should any problems arise. If you have a support contract we’ll be on hand to get your computer fixed quickly and reduce any downtime. We also cost much less than an onsite IT person but can perform exactly the same role, the only thing different is that we don’t need our own desk! Ensure business runs smoothly – Yes, your IT is working for now, but what would the affect be to your business if it didn’t? What would be the consequences if you lost all of your data or couldn’t access your files? We can help to ensure that your business stays running effectively and efficiently. On-hand IT professionals – Should you ever have a problem you’ll have instant access to an IT professional who can log -in to your computer to view and identify the issue straight away. Your employees can also call us directly when they’re experiencing an issue and cut out having to get a designated person to call. Monitored networks – We can monitor your network from our offices to ensure that any issues that are detected are fixed before they cause any down time. We can also provide weekly check-ups to make sure your back-ups are being completed correctly and that all of your data is safe and protected. Help and advice – You’ll have access to years worth of extensive IT knowledge and expertise which means that no matter what the problem, we are ready to help with anything, from simple software installation to full network support. So, how does it all work? Our support packages are tailored to each individual client. For those needing to keep costs low, we offer support on a ‘Pay As You Go’ basis. However, most of our clients choose to take a support package that includes a timed service level agreement. These cover unlimited telephone and remote support and on-site visits when required – we are your Outsourced IT department. For more information please contact us to talk through the options. When you buy a new computer it will come with Windows but not normally Office. Your new laptop or desktop PC will usually have the Windows operating system pre-installed but this will not include Office. Microsoft Office is the suite of productivity tools every business, student or home user needs but which must be purchased separately. We have migrated a number of old 'fixed line' telphone system to VoIP over the past few weeks and the customers have all been amazed at the ease of moving, the cost savings and the quality of the digital calls. 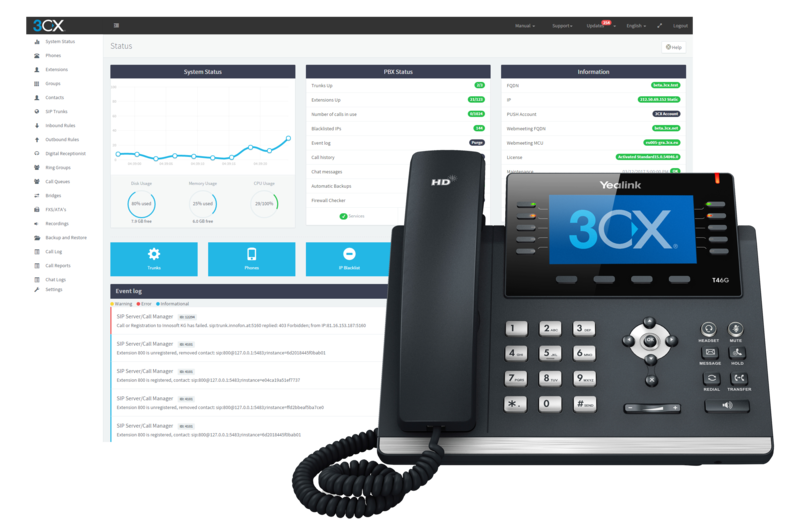 We offer 3CX hosted phone systems from as little as £10 per month for the phone system, hosting and basic maintenance. We then arrange for a VoIP virtual phone line to be setup with our partner - VoIP Unlimited who bill our customers directly for their line rental and calls. Line rental starts at £10.99 per month which includes up to 10 numbers. If you are moving offices and have been told you cannot keep your existing phone numbers, we can help you as any number can be transferred to VoIP and can then be taken anywhere. Our VoIP phone systems allow users to work away from the office but still make and answer office calls without any additional equipment. 3CX works very well on iPhone and Android and both Apps are free of charge. They allow the user to maintain an office presence at all times without the caller realising they are speaking to you on a mobile. 3CX also offer a web meeting service that's all included. This allows for web conferencing using video, desktop sharing, file sharing etc. It's basically 3CX's take on GoToMeeting but without the associated cost. Over the past few weeks, there has been a rise in reporting of a new crypto ransomware called LOCKY. This new type of malicious ransomware is as straightforward as they come— gaining access to systems via unsolicited email attachments. At first glance, the attachment appears to be a harmless Microsoft Word document; but as we’ve written about previously, this is a highly effective way for hackers to trick you into downloading their ransomware onto your own computer. Teaching your employees to err on the side of caution, especially with suspicious email attachments, is a top preventative measure when it comes to cyber security. Once the attachment is opened, the document contents will appear as jumbled text. The document will instruct the confused user to “enable macros if the data encoding is incorrect”, prompting many to follow these malicious instructions. At this point, unless you have a recent off-site backup, your files are inaccessible— unless you decide to pay the ransom. Ransom amounts have been reported anywhere between 0.5-2 Bitcoins (~$200-800) and require you to pay it within a specified amount of time. If the ransom is not paid before the time expires, all of your files will be permanently encrypted and therefore permanently inaccessible. While Locky is certainly a malicious and dangerous form of crypto ransomware, there are ways to avoid it. Businesses need to take virtual threats seriously which must happen in the form of layered security. While it is important to take some of these simpler security measures, we recommend getting a complete IT assessment to ensure that you have implemented a secure, layered approach to IT security. It’s never smart to roll the dice when it comes to cyber security, and applying a multi-layered tactic to fighting potential cyber threats is the only way to remain safe in this ever changing threatscape. These viruses can hit and infiltrate many areas of a specific computer and/or a network and have many tactics to do so. Having one approach is not enough. Antivirus alone cannot protect you from these attacks! With the advent in the last few years of solid state drives (SSDs) as a viable cost effective alternative to the traditional hard drive (HDD), we are now seeing lots of our customer request an upgrade to their existing machine, rather than what is often an expensive replacement. SSDs are built using the same technology that’s used in USB memory sticks are so work much more quickly than a traditional HDD which has moving parts. The traditional HDD has been around now for over 20 years in its current format and has always been the component that’s most prone to failure. An upgrade to an SSD is pretty much the best performance upgrade you can buy for your computer. Yes, it’s true that a faster processor, additional memory, and a faster graphics card may notably better the overall system performance, but compared to what an SSD can do, all those upgrades fall behind. There are many advantages solid state drives (SSD) have over traditional mechanical hard disk drives (HDD). The majority of these advantages are resulted from the fact that SSDs don’t employ any moving part in their architecture. In contrast to mechanical hard drives that use motors and moving heads, flash memory chips are the ones responsible for all the storage on a solid state drive. This feature offers faster data access, lower power requirements, and high reliability. Upgrading from your current hard disk drive to a solid-state drive seems like a natural thing to do. But before you proceed, you should realise that SSDs are not free of downsides/disadvantages, such as their steep price. As an example, a 1 TB SSD costs in the region of £200 (or £0.20 per GB), whereas the cost of a 1TB HDD is no more than £50 (or £0.05 per GB) which is a big difference. There’s also the issue of longevity. 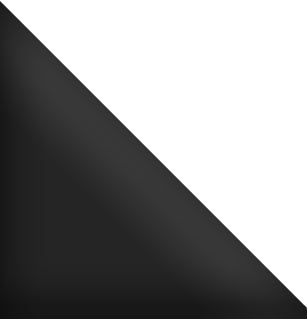 The type of storage chips used in SSDs can only be used for a finite number of writes. This ageing process only affects the ablity to write to the SSD so all of the data would still be accessible after many years. Most SSDs carry a minimum of a 5 years warranty too. In our view, the advantages far outweigh the disadvantages and we have found that a 3 year old computer upgraded with a SSD, performs as well or better as a new equivalent spec computer with an HDD. We've just completed a WiFi installation for a restaurant chain in Cambridge. The customer needed secure WiFi for their POS system but also WiFi access for their customers. We've achieved this with VLAN's and Ubiquiti access points. The customer is very happy that they can now take orders using their hand held devices at all of their tables! We have recently completed a server replacement for one of our customers. The unusual thing is though, they now don't have a server! We migrated their ageing Exchange 2003 setup to Microsoft Office 365 and we moved all of their data to a Synology NAS drive. 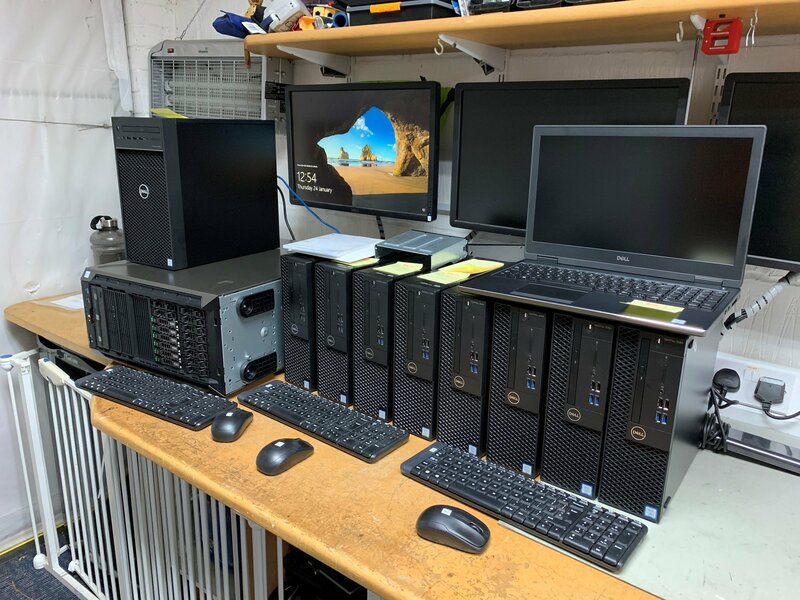 This setup cost about 10% of what the server would have been to replace, it's far easier to administer, takes up for less room and even consumes less power! All in a weekends work for us. If you are thinking that your existing setup needs a refresh, why not see if we can help? Microsoft is continuing to invest heavily in Office 365. Microsoft CEO Satya Nadella has made clear with his “mobile first, cloud first” strategy that Office 365 is part of Microsoft’s long-term strategic vision. This is good news for small and medium businesses. As Microsoft continues to add features and robust functionality, it ensures that smaller organisations will have access to advanced enterprise-grade capabilities that can transform their business and empower employees. Small business leaders who fail to take advantage of Office 365 risk losing their competitive advantage. Office 365 equips your organisation for success with enterprise-calibre capabilities and leading business technologies. Office 365 optimises employee performance, improves productivity, jumpstarts innovation, and improves team effectiveness. Here are six ways that Office 365 can transform the way your business functions. Office 365 gives you the flexibility to work how you want, where you want, and on what device you want. Microsoft has been continuing to expand partnerships and is showing an unprecedented openness to support the tools customers want to use. This is shown in its recent support for third-party backup services and expanding availability of native apps for Android and iOS. Most Office 365 plans allow the installation of Office, not just on PCs or Macs, but also on up to five tablets and phones. This allows you to work wherever you are, whether you are online or offline. You can even attend meetings and video conferences from your mobile device. Microsoft has been developing native apps for its Office suite for Android and iOS for a seamless experience. Office 365 provides a consistent and optimised experience across PCs, offline or online, mobile devices, and browsers. Office 365 facilitates dynamic team collaboration. Teams can improve communication and work together more seamlessly. Team sites keep important files accessible and easy to find. Team sites support automatic policies, rights protection, and archiving to ensure that valuable information is protected. Office 365 also supports project-specific mailboxes to easily find project emails. Office 365 supports version control and tracks comments and updates. This allow team members to work together on the same document. Files are always available with secure, encrypted OneDrive for Business. Files are automatically synchronised and saved online ensuring access to the latest version. Files can be edited and shared from any browser or mobile device.OneDrive for Business is a vital tool to discourage users from saving sensitive corporate information in unmanaged and potential unsecure cloud services. Users can easily access files from any device, on-demand.Files can be shared with others who are in or outside of the organization, such as business partners, contractors, and customers. Access control allows you to determine which users can view and which can edit documents.Those outside your organisation do not need Microsoft Office or Office 365 to edit documents. Microsoft is releasing apps that allow those with no Office 365 subscription to edit Office content on iPhones, iPads and Android devices.In addition to OneDrive for Business, Office 365 support of third party backup services such as Box and Dropbox for Business. Office 365 supports HD video for up to 250 people. Online meetings and video conferences can be set up in advance or at the spur of the moment, with a few clicks in your familiar Outlook interface. Meeting can be joined quickly and easily through the Outlook calendar invite. Real-time note taking and one-click screen sharing, recording and file uploads provide a robust collaborative experience. Yammer’s corporate social network allows employees to share information and ideas across departments and locations. The free exchange of ideas and information can jump start innovation by spurring creative thinking, and generating fresh ideas to solve problems and improve processes. Yammer also helps employees easily identify resources and find information, across the business groups allowing them to work better and faster. Outsourced IT can help your small business function better with Office 365 and our proactive managed IT services. Managed services and Office 365 ensures a reliable, stable IT infrastructure that is always up to date and secure. This allow you to focus on driving your core business goals. Outsourced IT can help you evaluate Office 365 and determine if it is right for your organisation. Additionally, our managed services offerings can further reduce IT management burdens and further optimise your computing environment. Contact us to set up a free trial customised for your organization. We've just spent the weekend migrating one of customer Exchange 2007 setup to Office 365. All email, calendars, contacts etc migrated without a hitch. Their existing server is now much quicker as it is not having to run Exchange so not only have they benefitted from an increase in speed, they also don't need waste money on upgrading their server. Have a look at http://spamcontrol.outsourced-it.co.uk to get a feel for the new system. If you're interested in stopping those unwanted emails, give us a call. Just renewed a clients Anti Virus protection on 90 computers without touching a single one! We've just migrated 90 of our customers computers onto AVG CloudCare and all we did was sent each user an email link. This clever software downloads itself, uninstalls any other anti-virus software, then installs itself and registers on our portal so we can monitor the status. We are now alerted to any infections they may be unfortunate enough to get but we can also clean and update these computers remotely meaing the customer is not inconvenienced. Even when you have experience in house IT (like we do ;-) a cloud based email system now even makes sense to us! The storage available to users and the ease of migration now means that everyone business should look at their email solution. Don't put up with an antiquated system that stops you seeing email across all of your devices when it's so easy to 'Go Cloud'. Managed to get image restored within 14 hours which is not bad for a Windows 2008 SBS server with 400Gb of data and 35 Exchange users! Client very grateful that our disaster recovery service is all included in their mainteance contract. Luckily we have been monitoring their backups so we're confident that we'll have them up and running again on one of our loan servers within 8 hours. 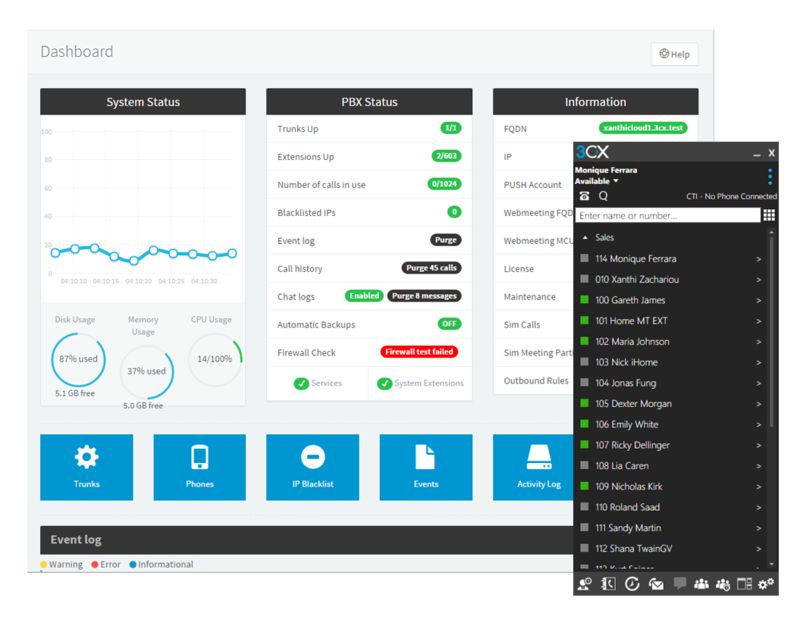 Have you heard about our Server and Workstation monitoring? We now use monitoring software on all of our maintenance contract clients so we know there's a problem before they do! Wow our website is now live. Enjoy!